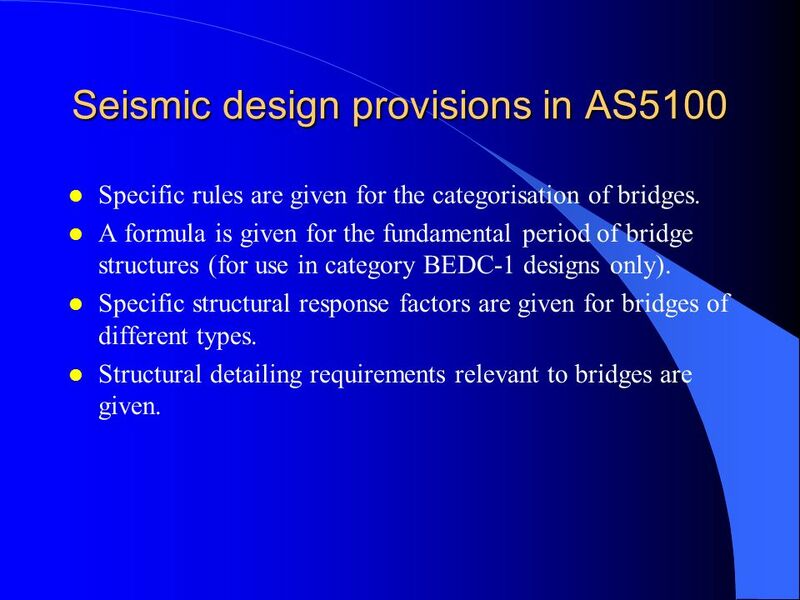 Specific rules are given for the categorisation of bridges. 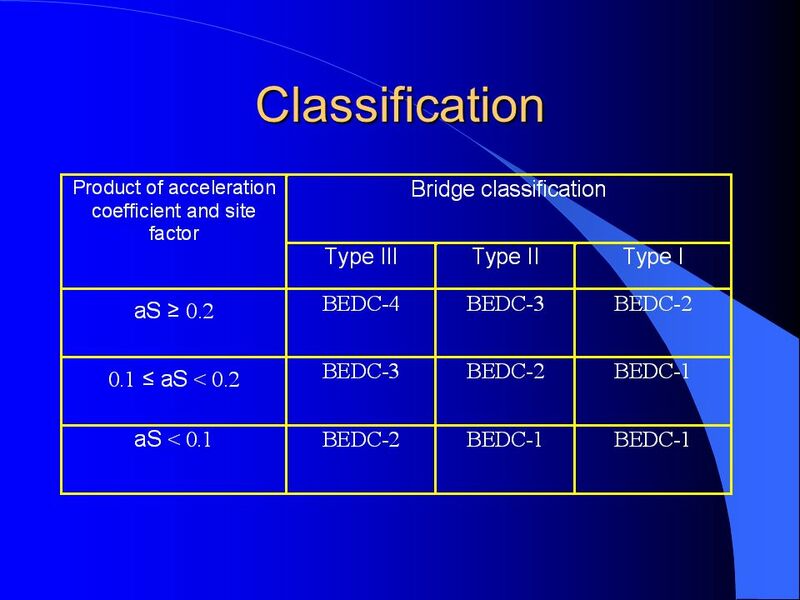 A formula is given for the fundamental period of bridge structures (for use in category BEDC-1 designs only). 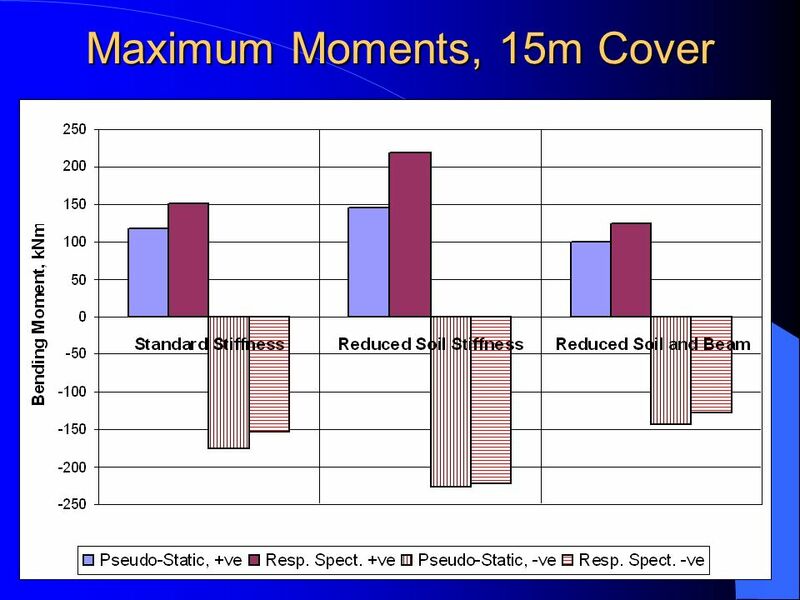 Specific structural response factors are given for bridges of different types. 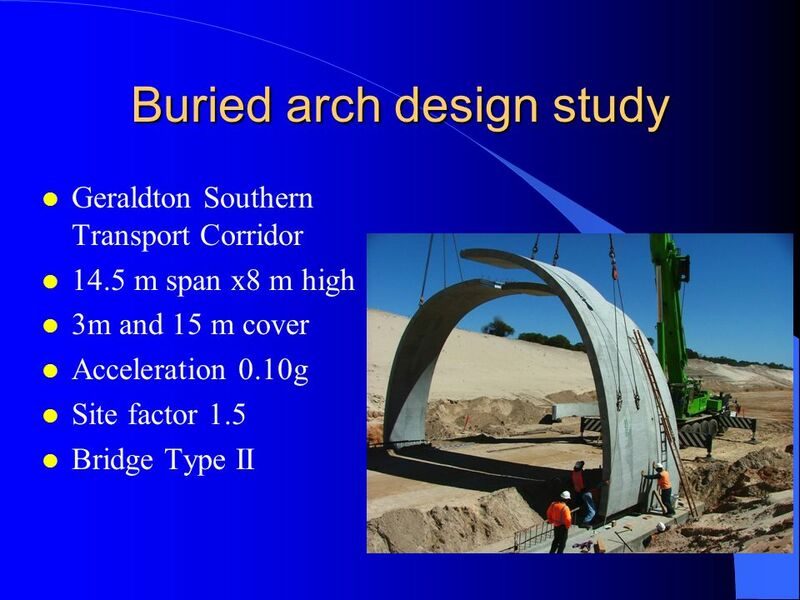 Structural detailing requirements relevant to bridges are given. 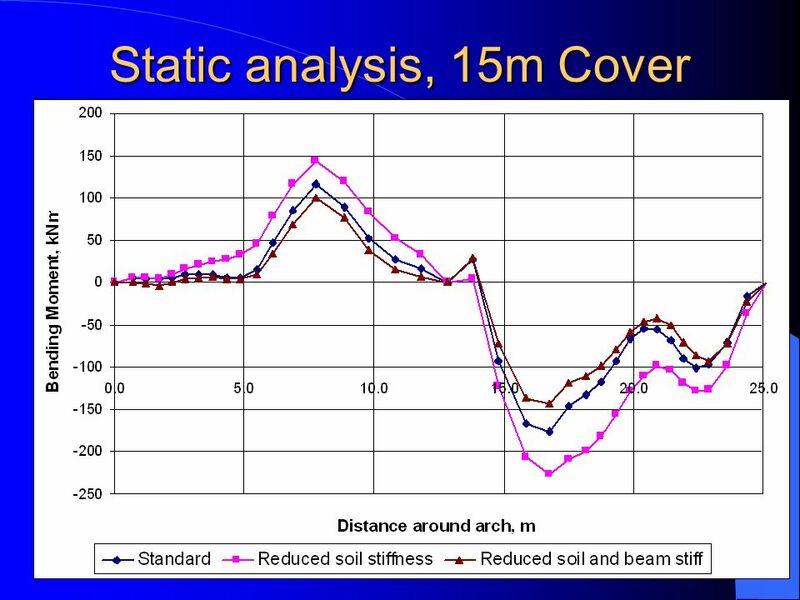 The requirements for more detailed analysis methods are related to bridge span, and may not be relevant to buried structures. 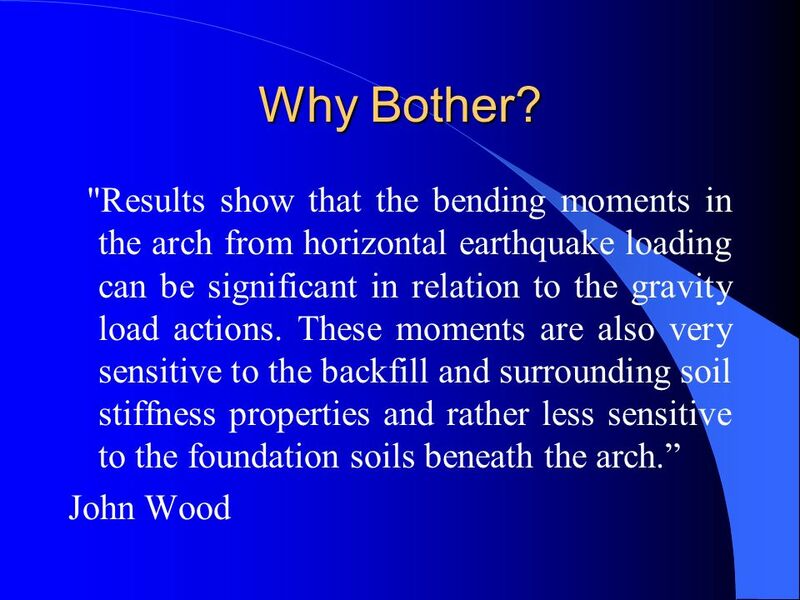 Vertical earthquake effects may be important for buried structures, but only horizontal effects are required to be considered for almost all buried structures. 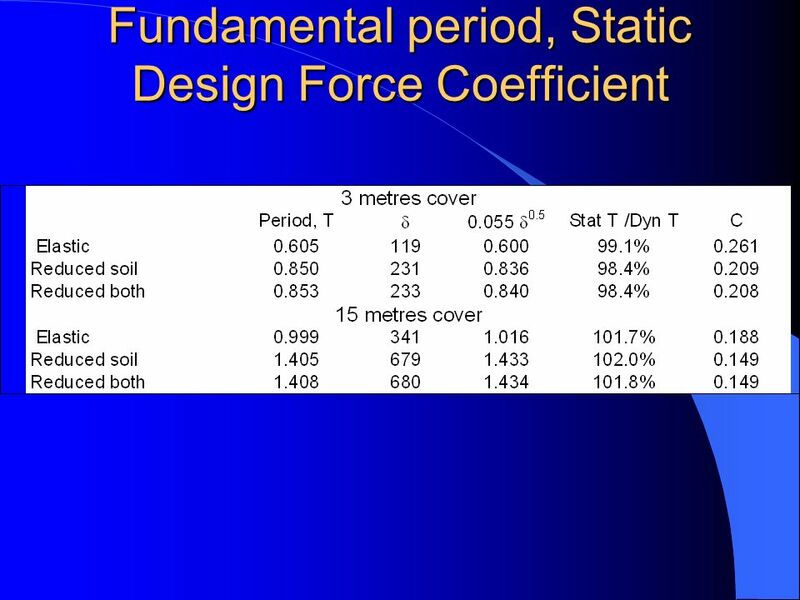 The formula for the fundamental period is not applicable to buried structures. 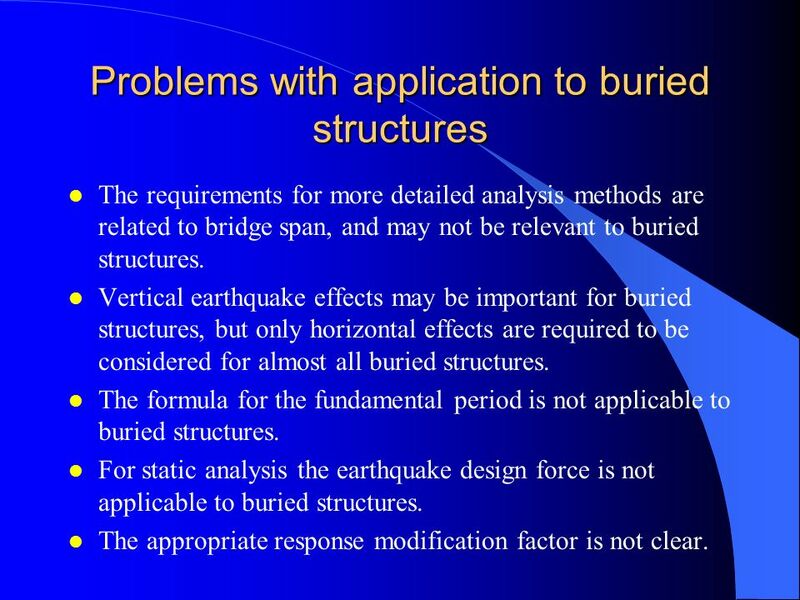 For static analysis the earthquake design force is not applicable to buried structures. The appropriate response modification factor is not clear. 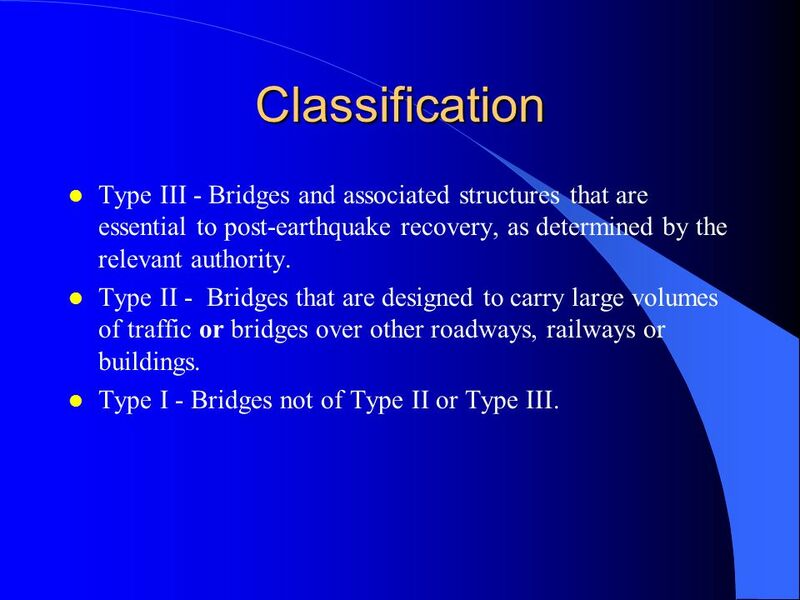 7 Classification Type III - Bridges and associated structures that are essential to post-earthquake recovery, as determined by the relevant authority. Type II - Bridges that are designed to carry large volumes of traffic or bridges over other roadways, railways or buildings. Type I - Bridges not of Type II or Type III. 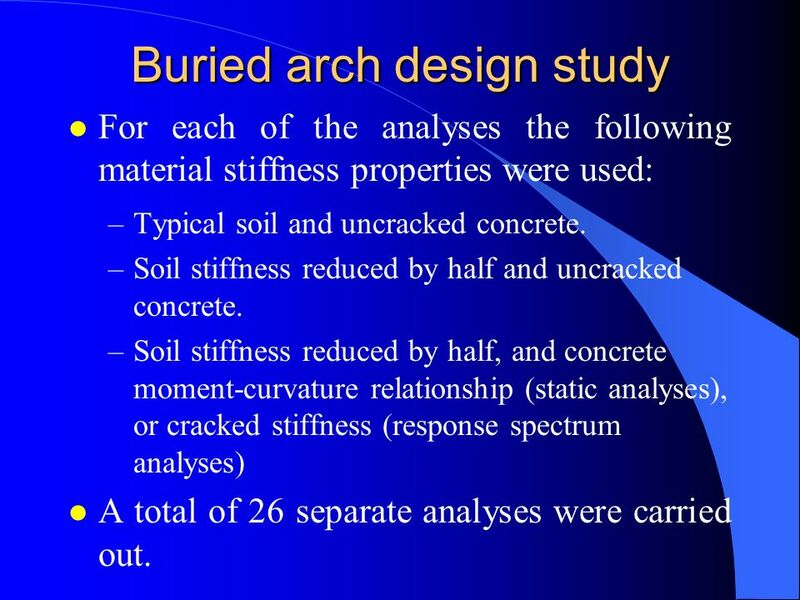 For each of the analyses the following material stiffness properties were used: Typical soil and uncracked concrete. 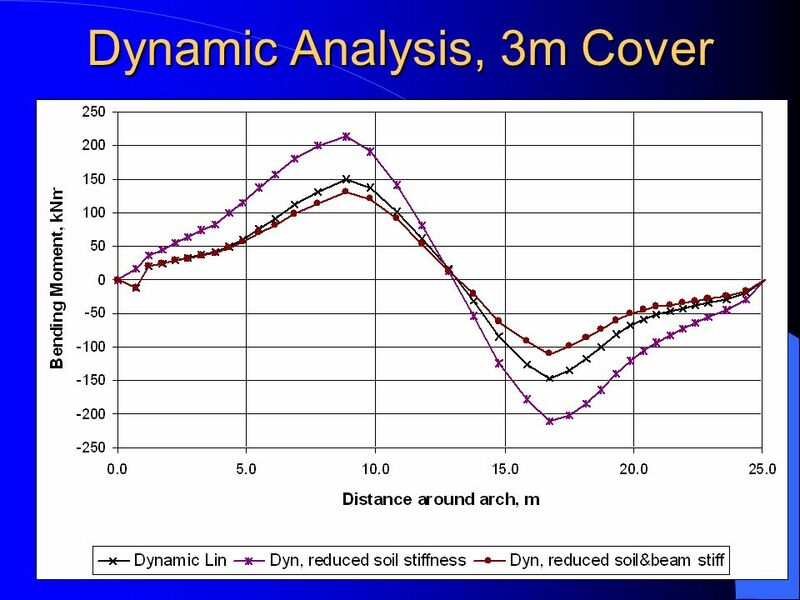 Soil stiffness reduced by half and uncracked concrete. 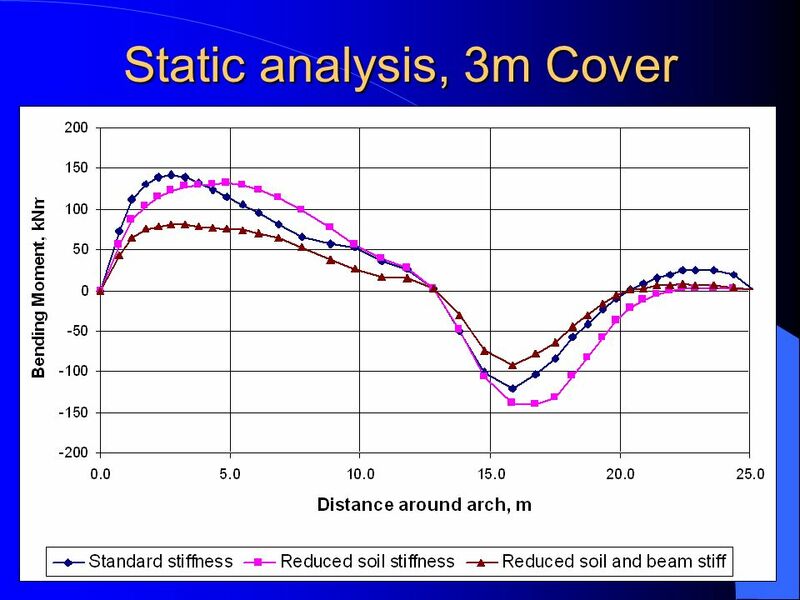 Soil stiffness reduced by half, and concrete moment-curvature relationship (static analyses), or cracked stiffness (response spectrum analyses) A total of 26 separate analyses were carried out. 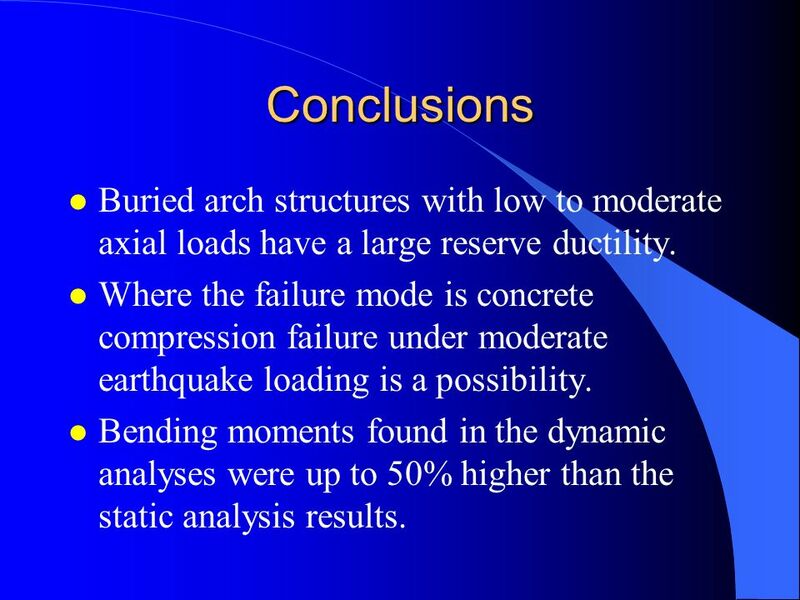 26 Conclusions Buried arch structures with low to moderate axial loads have a large reserve ductility. 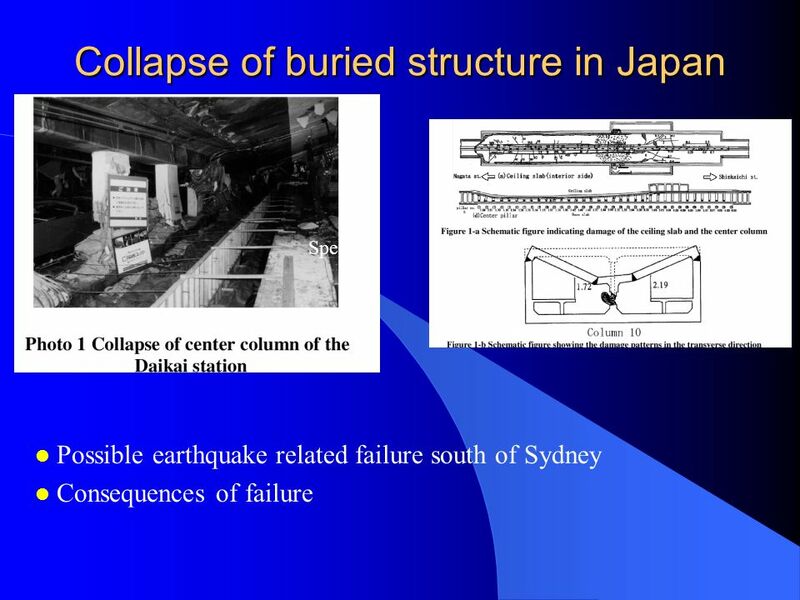 Where the failure mode is concrete compression failure under moderate earthquake loading is a possibility. 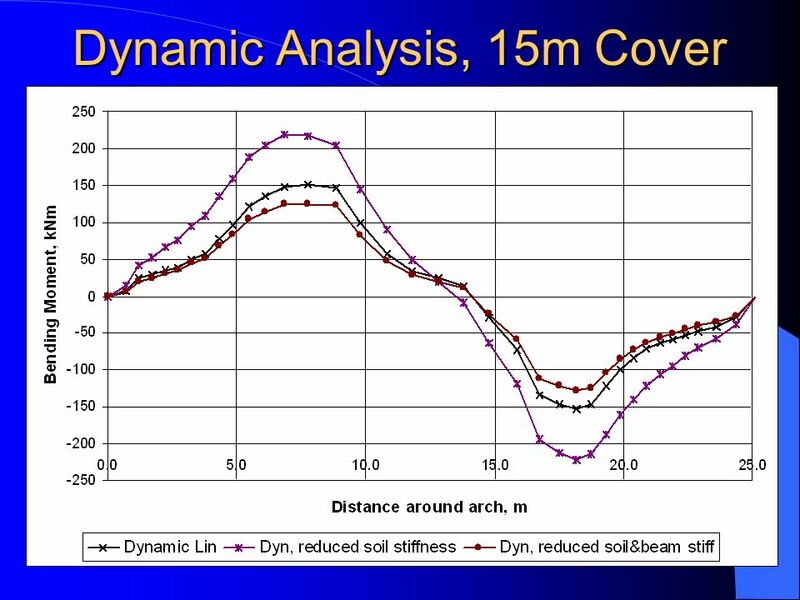 Bending moments found in the dynamic analyses were up to 50% higher than the static analysis results. Structure classification be related to fill height, rather than span. 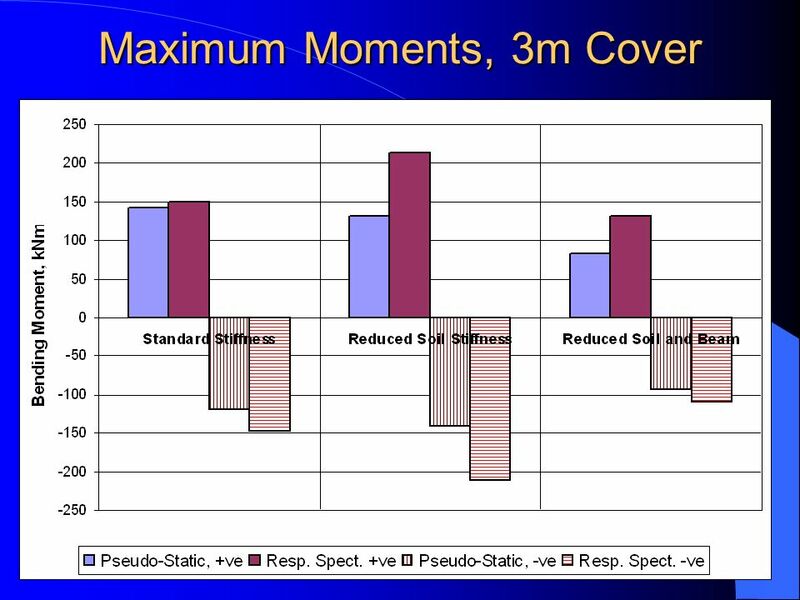 Response modification factor to be related to the capacity reduction factor. 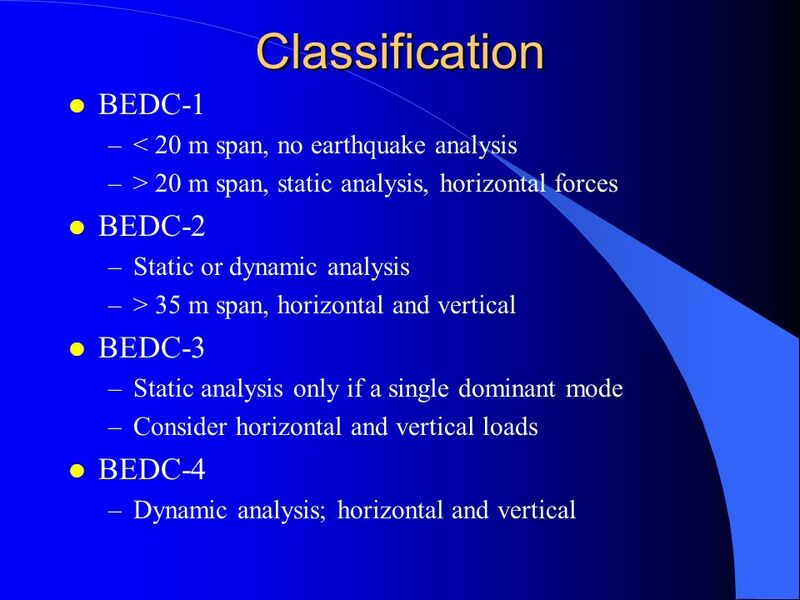 BEDC-1 and BEDC-2: design for vertical and horizontal earthquake loads, using static or dynamic analysis. 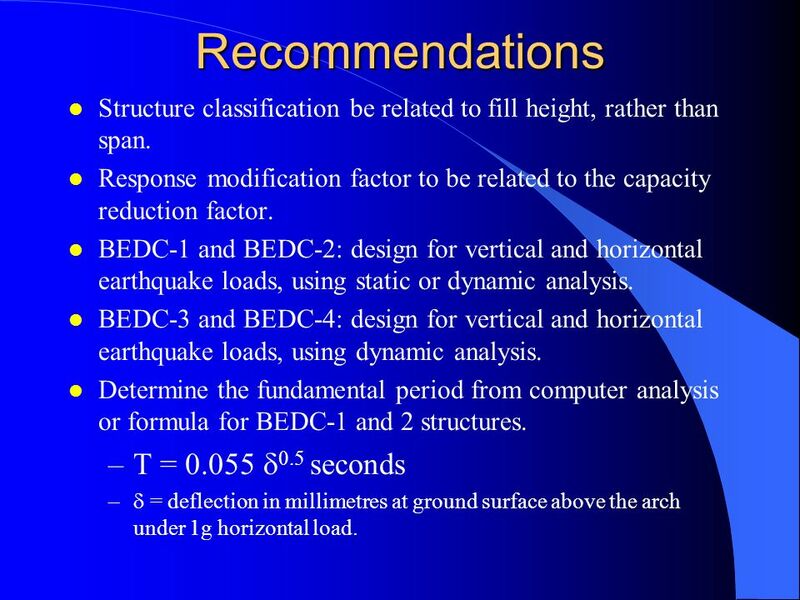 BEDC-3 and BEDC-4: design for vertical and horizontal earthquake loads, using dynamic analysis. 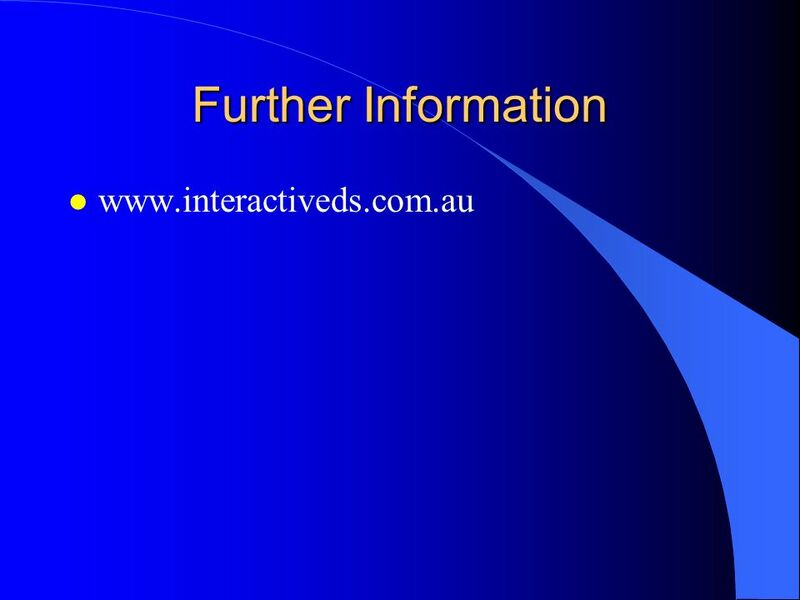 Determine the fundamental period from computer analysis or formula for BEDC-1 and 2 structures. 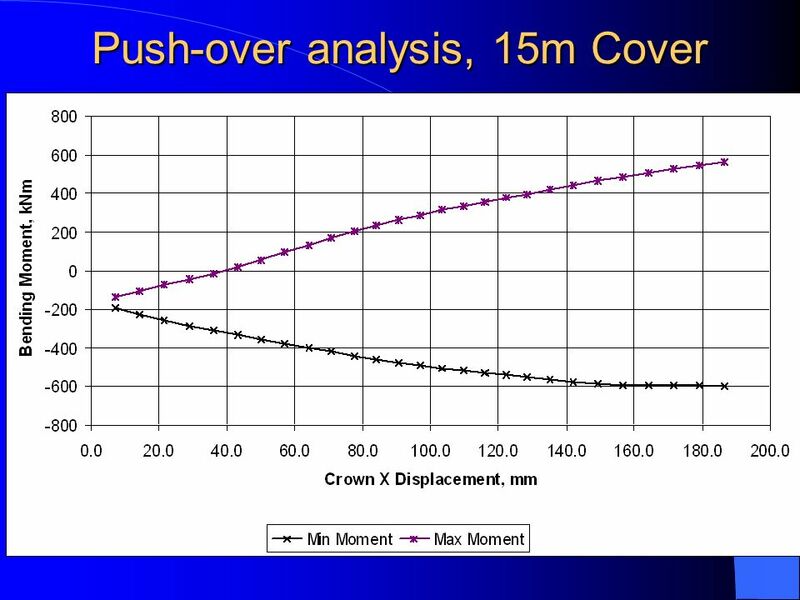 T = 0.5 seconds  = deflection in millimetres at ground surface above the arch under 1g horizontal load. Download ppt "Seismic Design of Buried Structures"
CALCULATED vs MEASURED ENERGY DISSIPATION. 1 LESSLOSS Sub Project 7 Techniques and Methods for Vulnerability Reduction Barcelona 18 th May 07 – Lisbon 24 th May 07 LESSLOSS Dissemination Meeting. 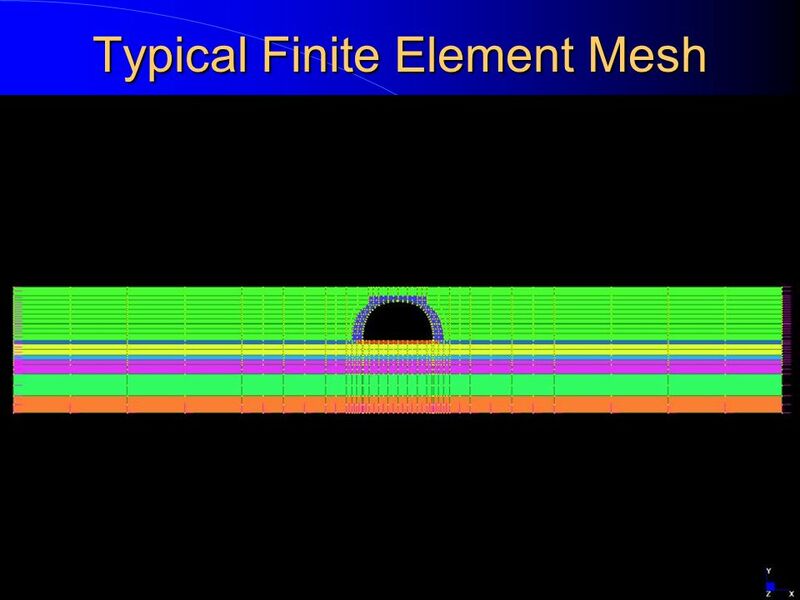 SECME Requirements Building Bridges: SECME Requirements. 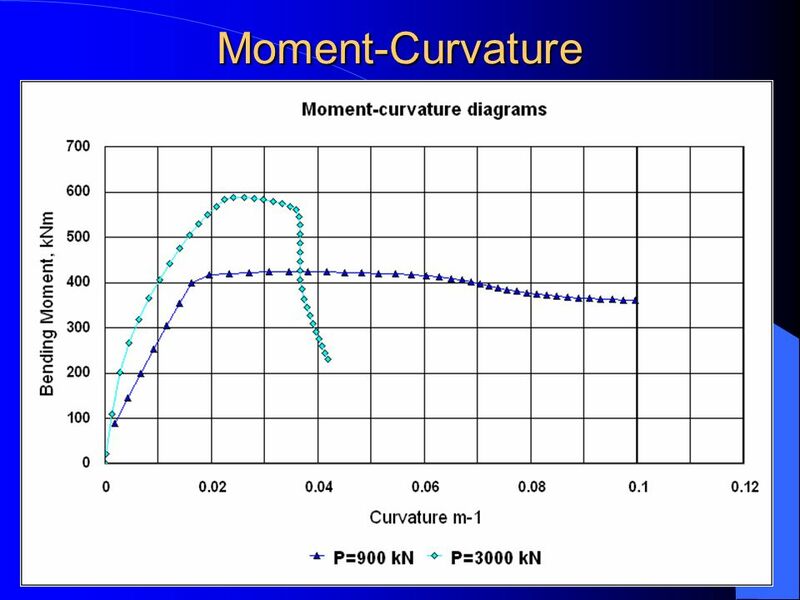 1 Fundamentals and Application of Stress Ratio in Concrete Pavement Design Edward H. Guo Consultant April , 2012 FAA Working Group Meeting. 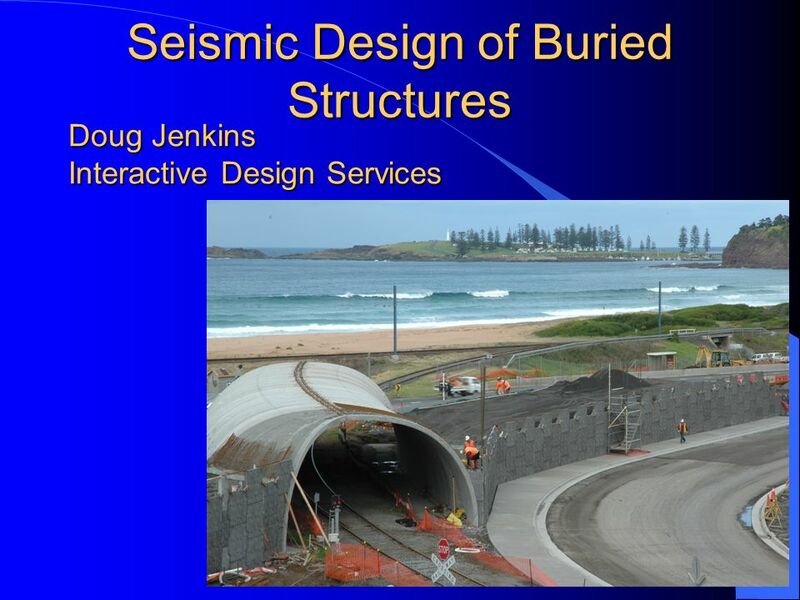 Optimising Building Design for Sustainability Using High Performance Concrete Doug Jenkins - Interactive Design Services Daksh Baweja – The University. 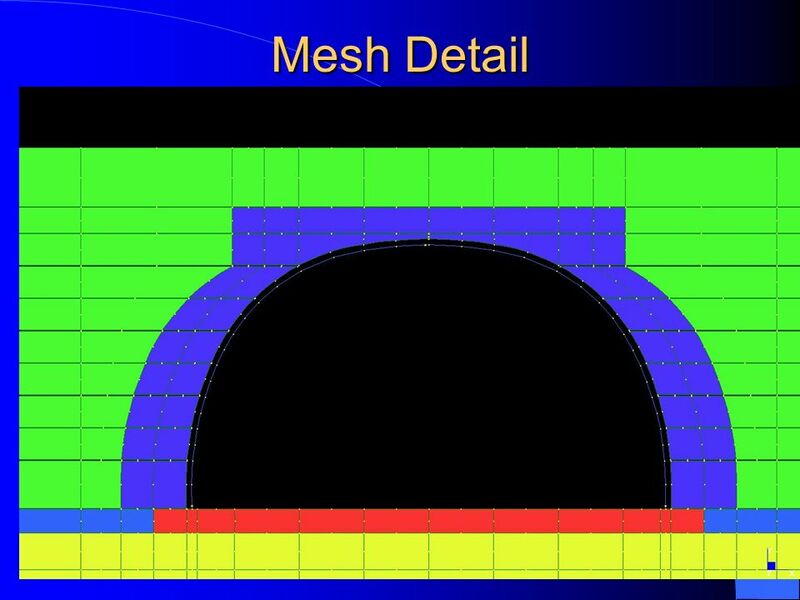 Cracking, Deflections and Ductility Code Provisions and Recent Research October 2006 Serviceability and Ductility The Other Limit States. 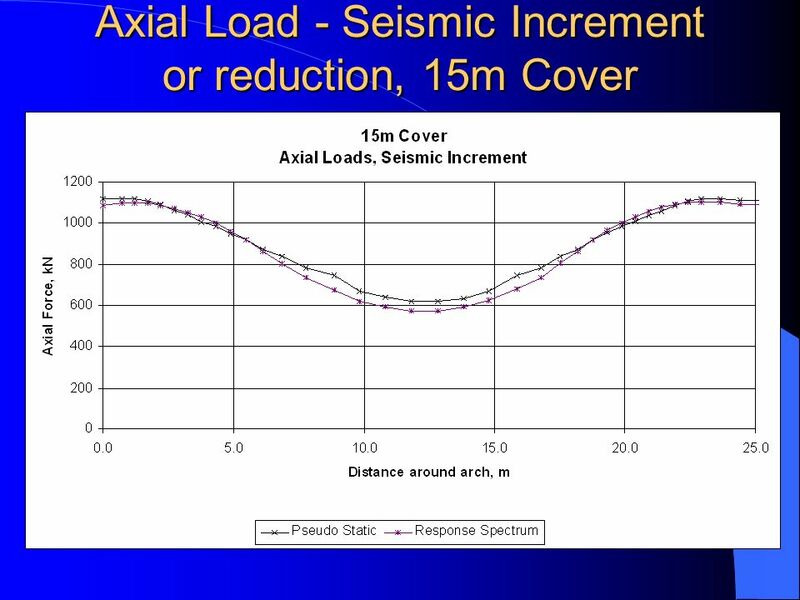 Seismic Code Highlights Determining what level of Seismic Restraints are Required Arkansas Fire Prevention Code 2002 Based on the IBC 2000. Application of Fluid-Structure Interaction Algorithms to Seismic Analysis of Liquid Storage Tanks Zuhal OZDEMIR, Mhamed SOULI Université des Sciences et. Structural Principles and Landscapes Over Structure GSD 6242 Ecologies, Techniques, Technologies IV Spring 2015Niall Kirkwood FASLA Alistair McIntosh FASLA.